Distracted? Frustrated? Wasting Your Time? I was frustrated at the time. I’d become overwhelmingly “busy” with things that didn’t really matter to me. Unrewarding projects were taking too long; I was working inefficiently. The lure of Facebook, Instagram, Pinterest, Reddit, and Words With Friends had become almost irresistible. What had happened? I used to be good at keeping distractions in a box. I’d long ago learned not to check e-mail outside of the workday; why was I suddenly having so much trouble with these other distractions? The quote reminded me of what I already knew, a few layers down. I’d drifted away from some of my big-picture goals. My daily writing practice had been disrupted. My planning system was in flux and not yet fully supporting my focus. In the absence of my goals, trivia had become my master. I had enslaved myself to things I didn’t care about. Naming the situation for what it was had an almost immediate effect. I reconnected with my self-discipline and created boundaries where I needed them. I started rewiring the bad habits I’d developed. If you too find yourself “procrastinating” more than seems reasonable, ask yourself: Do I know what I really want to be doing right now? What is it that I’d planned to accomplish this year? 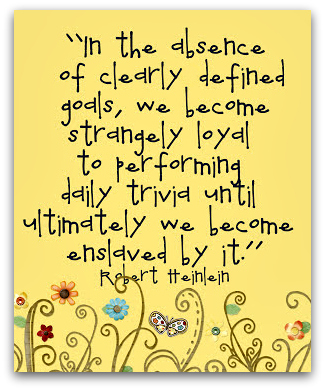 What can I do to move toward my big-picture goals before the calendar flips to 2014? But lest I take up more of your time with delightful quotes, step away from the trivia, and spend your hours where they count. Brilliant quotation! I’m going to have to remember that. As a stay at home mom, it particularly resonates right now! I’m definitely stuck in this rut too, and have been for some time. I’ve become a virtual (no pun intended) slave to Facebook, YouTube and other trivialities as well. I’m also painfully aware that it’s precisely *because* it provides a distraction from the isolation and tedium of my day job that I’ve been unable to resist the siren call. Trouble is, I think it’s also impeded me from moving forward with my own ambitions of moving on to bigger and better things. Very insightful as always, Miranda! Nice quote. I must remember that when I sit at my computer to”write’ and but am lured away by what my hundred friends whom I have not met the last few years are up to on Facebook or wonder if I can take up rock painting or ribbon embroidery after seeing all the cutie things posted on pinterest. I don’t know if I believe that. The Buddhists believe before enlightenment, sweep the floor. After enlightenment, sweep the floor. Creativity can happen anywhere and doesn’t always follow goal-setting. Then again, holding yourself accountable can help you reach creative goals. I think they are two different things: creativity for creativity and creativity for output. As a practicing Buddhist, to me this falls into the category of right effort. If you meditate for 45 minutes every morning but make no effort to stay focused on the present moment, you aren’t going to get much benefit out of meditation. In Buddhist terms, there is nothing wrong with having goals, so long as the pursuit of those goals does not interfere with your ability to be in the present moment.